Particle accelerators are exciting research tools that provide energetic high brightness charged particle beams that can be used to probe physical phenomena otherwise inaccessible. However, the enormous cost and user demand of many of the radio-frequency based accelerators limits their availability. To provide an accelerator accessible on the university-lab scale, a novel accelerator design must be developed. One such design, whose development has been recently funded by the Gordon and Betty Moore Foundation (press release), is the Dielectric Laser Accelerator or DLA for short. DLAs leverage both the GV/m electromagnetic fields of commercially available lasers and the advanced nanofabrication techniques of dielectric materials developed in the semiconductor industry. The large available electromagnetic fields are used to create acceleration gradients that exceed those in radio frequency accelerators by a factor of 100. Even though DLAs are orders of magnitude smaller than their RF brethren, their accelerating gradients allow for DLAs to impart similar energy gains to charged particles. However, instead of imparting these energy gains over meters, DLAs impart these energy gains over millimeters, potentially enabling a University Lab-scale high energy particle accelerator. The DLAs tested at FAU operate in a phase-synchronous scheme, as follows. An incident laser pulse impinges upon a nanofabricated accelerating structure, exciting travelling near-field modes. Electrons, propagating in close proximity to the structure, are accelerated when their velocity matches the phase velocity of one of the traveling modes. This synchronicity condition and general principle is similar to that employed in large-scale RF accelerators, and the structures are designed to satisfy this condition (see video produced by our SLAC partners on the dual-grating approach). Already there have been repeated confirmations that this principle of acceleration works over a wide range of electron velocities (from 15% to 100% of the speed of light) and lasers [1,2,3,4]. The AChIP collaboration aims to extend the success of DLAs towards the realization of the analogy of an accelerator beamline. 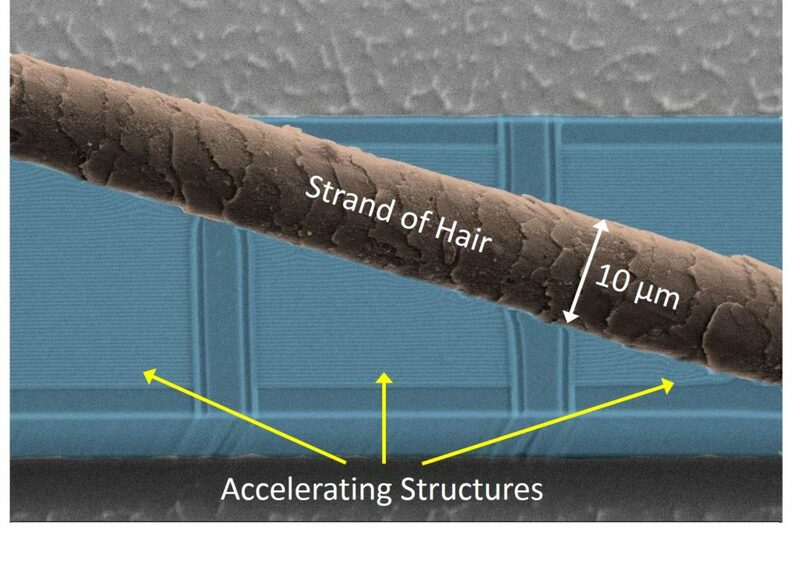 Multiple stages of dielectric-laser based acceleration, focusing, and diagnostics are being developed and tested. Specifically, auxiliary dielectric elements can be integrated [4,5] to additionally provide spatial focusing, steering, and bunching of electron pulses, important elements making up an essential toolbox in any particle accelerator. An alternative solution to electron pulse bunching using nanostructures involves the second-order all-optical ponderomotive scheme, in which two crossed laser beams generate an optical wave, either standing or co-propagating with the electron pulse. Free electrons impinging on such a transvers intensity grating will predominantly diffract as in the Kapitza-Dirac effect, or strongly disperse in a longitudinal grating . In the latter case, a relatively long (~100 fs) electron pulse may be structured into a train of attosecond bunches with lengths below 300 as . Such highly-bunched electron trains may be interesting not only for acceleration, but also for the fine time-resolved probing of structural and chemical changes in atoms, molecules, and solids. 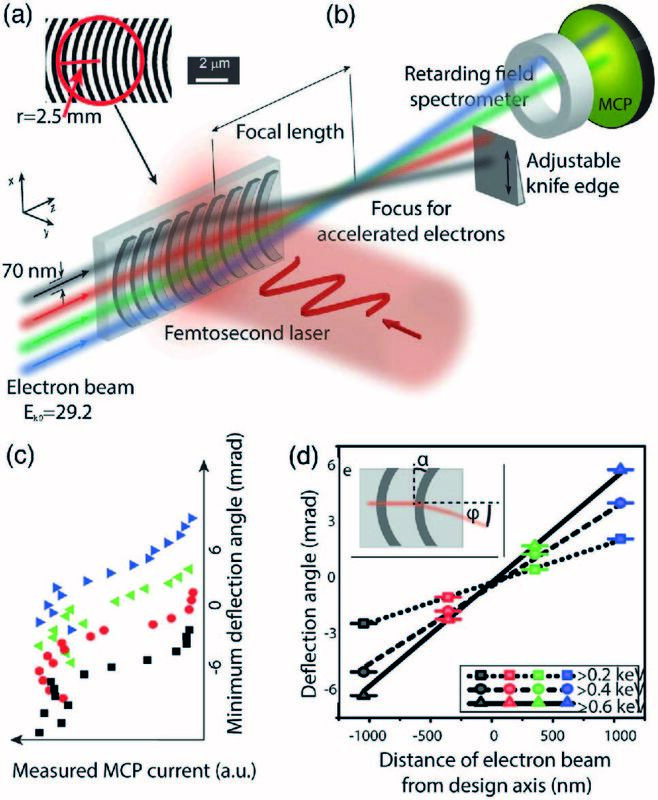 A laser-triggered electron cathode appropriate for operation with DLAs will eventually be incorporated with the multiple stages, resulting in a beamline where electrons are generated via laser-triggered emission, and then alternatingly accelerated, collimated, and diagnosed with sequential DLA-based devices. A hypothetical schematic of such a device is shown below. The resulting beam may be used as a high brightness light source via the incorporation of an element that wiggles the electron beam transverse to its direction of motion, creating photons as the beam alternatingly curves upwards and downwards. The compact size of such a beamline and its various components allows for many exciting applications, ranging from handheld MeV electron sources for tumor irradiation to table-top Free Electron Lasers . E. A. Peralta, K. Soong, R. J. England, E. R. Colby, Z. Wu, B. Montazeri, C. McGuinness, J. McNeur, K. J. Leedle, Walz, E. B. Sozer, B. Cowan, B. Schwartz, G. Travish R. L. Byer, “Demonstration of Electron Acceleration in a Laser-Driven Dielectric Micro-Structure,” Nature 503, 7474 (2013). K. J. Leedle, A. Ceballos, H. Deng, O. Solgaard, R. Pease, R.L. 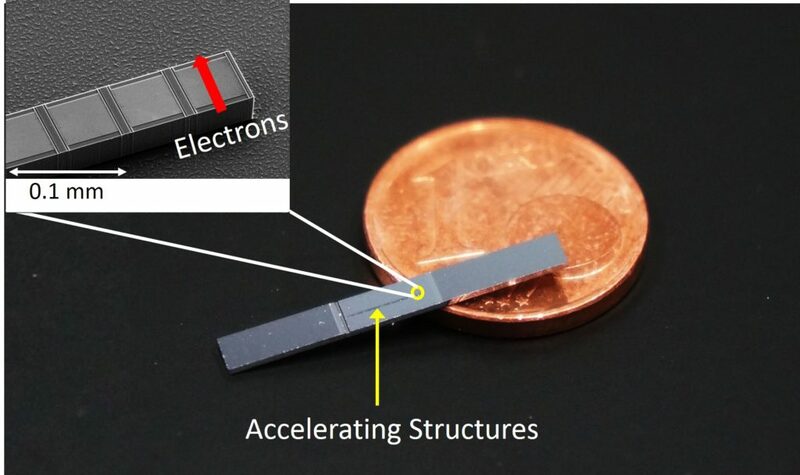 Byer, J. Harris, “Dielectric Laser Acceleration of sub-100 keV Electrons with Silicon Dual Pillar grating Structures,” Optics Letters 40 18 (2015). 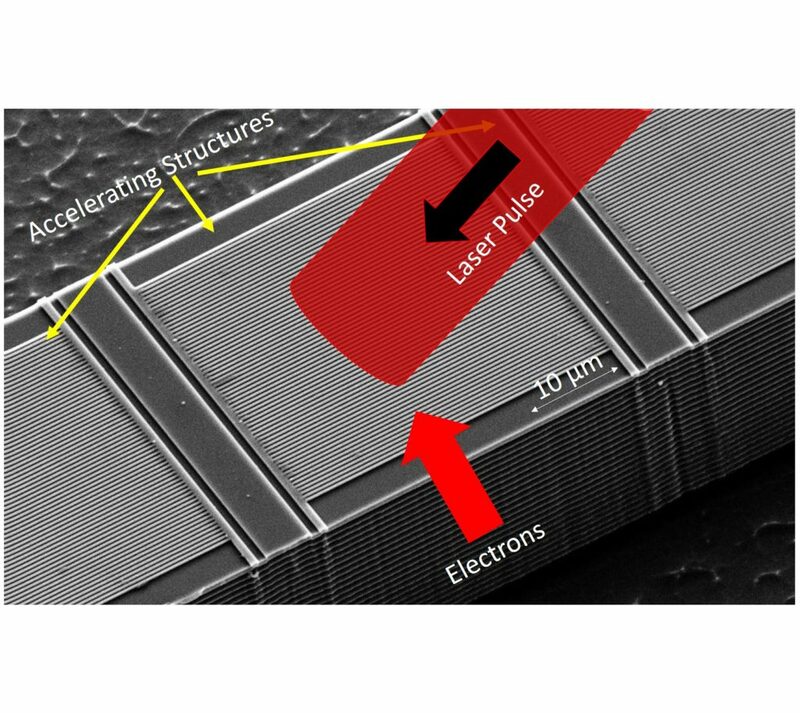 J. McNeur, M. Kozak, D. Ehberger, N. Schönenberger, A. Tafel, A. Li, P. Hommelhoff, “A miniaturized electron source based on dielectric laser accelerator operation at higher spatial harmonics and a nanotip photoemitter” J. Phys. B: At. Mol. Opt. Phys. 49 034006 (2016). 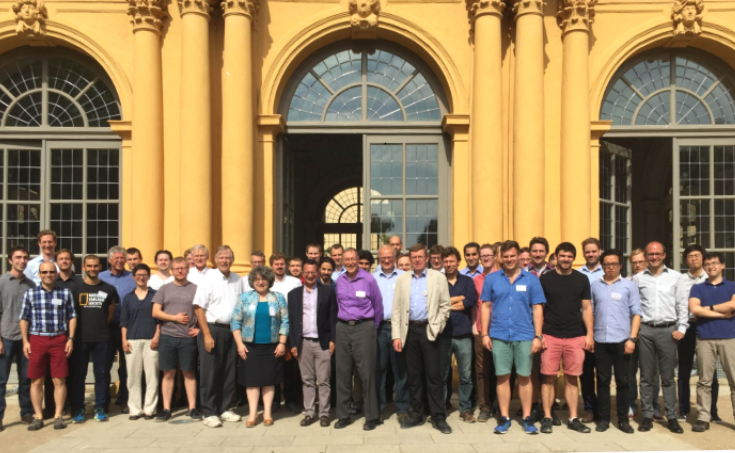 J. McNeur, M. Kozák, N. Schönenberger, K. J. Leedle, H. Deng, A. Ceballos, H. Hoogland, A. Ruehl, I. Hartl, R. Holzwarth, O. Solgaard, J. S. Harris, R. L. Byer, and P. Hommelhoff, “Elements of a dielectric laser accelerator,” Optica 5, 687-690 (2018). M. Kozák, T. Eckstein, N. Schönenberger & P. Hommelhoff „Inelastic ponderomotive scattering of electrons at a high-intensity optical travelling wave in vacuum,“ Nat. Phys. 14, 121 (2017). M. Kozák, N. Schönenberger, and P. Hommelhoff, “Ponderomotive Generation and Detection of Attosecond Free-Electron Pulse Trains,”, Phys. Rev. Lett. 120, 103203 (2018). R. J. England, R. J. Noble, K. Bane, D.H. Dowell, C. Ng, J.E. Spencer, S. Tantawi, Z. Wu, R. L. Byer, E. Peralta, K. Soong, C. Chang, B. Montazeri, S.J. Wolf, B. Cowan, J. Dawson, W. Gai, P. Hommelhoff, Y. Huang, C. Jing, C. McGuiness, R. B. Palmer, B. Naranjo, J. Rosenzweig, G. Travish, A. Mizrahi, L. Schachter, C. Sears, G. R. Werner, R. B. Yoder. “Dielectric Laser Accelerators,” Rev. Mod. Phys. 86, 1337 (2014). All pictures may be used if properly credited.